Located in the downtown area of Lawrence, was located very close to the Courtyard Marriott so made for an enjoyable evening out with the ability to walk home. Not a huge space, although there is an upstair area. We talked with some locals and they told us this place can get super crowded on some nights. I was there on a Wed night and it was busy but not an issue for getting served quickly. Loved their slogan "Because without beer, things do not seem to go as well." Had a pretty wide selection of beers when I visited, probably 12 or so on tap. Had the John Brown Ale, the Imperial IPA and Oatmeal Stout. All three were excellent. Definitely would be a place I'd visit often if I lived nearby. On the third day of our short trip to Kansas City we took a little jaunt off to Lawrence, Kansas. At the prompting of a couple of my friends, I was interested in checking out two brewpubs located in this city. About an hour's drive from KC, we arrived in town around noon with the first stop along the city's downtown main street at Free State Brewing. This has the look and feel of a late 1980's classic brewpub, with a small restaurant area and a tiny bar in the corner. There is also an upstairs area that I did not explore, but assume there is more seating up there. We hit the place just before the lunch rush, because shortly after we were seated a line of patrons developed. Our server was very helpful and knowledgeable about the beers, and brought us a large sampler of said beers. The Miller IPA was wonderful, having a fruity Citra hop flavor and aroma with a thicker mouthfeel than most from oats in the grist. The stand out beer was the Brightwater Saison, made with Nelson Sauvin hops. I had a very good beer made with the same hops at the Boulevard tap room, but the Belgian yeast did something to this version that truly made the beer pop with the fine melon and grass of a New Zealand Sauvignon Blanc. Wow! Every beer here was solid, well crafted and balanced. Brewer Geoff Deman really knows what he is doing, and I highly recommend a trip down to the brewery. The fish and chips were also excellent, a perfect match to the beers! I would tell you about the best beer that I have ever had but that would mean there would be less for me. There are a couple of beers that are must haves, the rest are average. Service was very good, and the food was well priced for the portion sizes. If you are near KU add Free S needs to be on your list of places to check out. This review has to be 75 words so I'm trying to fill some space right now to get around that. We had dinner here on a Sunday evening so the crowds were managable. I had the Big Sea ESB which was fantastic. It was brewed in a British style (that is without Cascade hops). It was smooth and went down like velvet. My wife had the Ad Astra Ale which she said she thought was the best beer she had ever had. We had the gumbo which was excellent. My wife had the carrot cake for dessert and I had a third ESB. I wish this place were closer to my home. We stopped by the Free State Brewery in Lawrence, Kansas on a Saturday afternoon. They had a nice selection of beers to choose from. We tried the sampler which came with a Copperhead Ale, Emancipation Ale, Oatmeal, Stout, Wheat State Golden, Lemongrass Rye, and an Ad Astra Ale. By far I thought the Copperhead Ale was the best, and had a couple pints after the sampler. We also had a couple of appetizers which were very good. We were in an upstairs dining area that was comfortable with a good view of the brewing equipment. We were seated quickly and service was excellent despite the crowded brewpub. All in all quite an enjoyable experience. The Free State Brewing Company is the best brewery in Lawrence, KS. It has the distinction of being the 1st legal brewery in Kansas since prohibition times. The owner was instrumental in getting liquor laws changed in Kansas prior to opening. In addition, they always have 2 to 3 more seasonal and special beers on tap. For example, in the cold of winter they offer my personal favorite Invigorator Dopplebock and in the Spring they offer a Maibock. They experiment with different hops in a beer they occasionally offer called Hopjack Pale Ale. There is always something new, just check out the listing of beers on their website. The staff at "the brewery" is well informed of the beers choices and can always help you make a decision. The food and service are both excellent. The 1st reviewer of the Free State had a list of annoyances which is their opinion, but I personally wouldn't down grade a brewery just because they're busy. They're busy for a reason. Belly up to the bar, order a quality beer and enjoy it while you wait for your table. 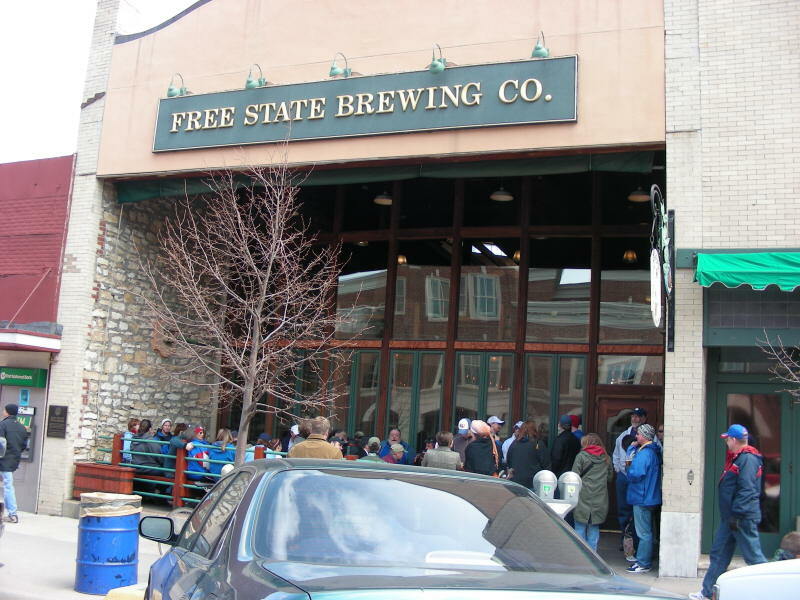 The Free State Brewing Company is my favorite brewpub of all that I've come across, and I try to visit new ones every time I have the opportunity. I've found some good ones, but I ultimately end up saying, "... this is good, but not as good as the Free State". Aahhh yes, the Free State. This is Lawrence's favorite, though our personal favorite in Lawrence is several blocks away (see that review). Free State Brewery brews great beer and makes it available by the pint, growler, and a variety of keg sizes. I particularly enjoy the Copperhead Pale Ale and use the 1/6 BBL in my kegerator at home. Annoyances: Don't expect to get a seat in Free State with a party greater than 2 between the hours of 4p-8p. On any day. Ain't happening without a 30-45min wait. If you could get a seat at the bar and quaff a couple of beers, it would be tolerable, but forget that too. And don't even think about sitting in the outside area while you wait, either, if the temp is above freezing. Stand in the hallway like everyone else while you wait for the flashing pager thingy in your hand to light up.